ASPA Paper | ZIRCAR Refractory Composites, Inc.
ZIRCAR Refractory Composites, Inc. offers a wide range of insulating refractory papers. These non woven, non-asbestos, fiber-based products are engineered as thermal barrier materials for use in high temperature applications up to 1450°C (2642°F). Commonly used in the molten metal casting and heat treating industries, ZRCI materials are also used as specialty gasketing in the fuel cell, nuclear, glass and electronic industries, as well as many other applications which require high temperature stability and low thermal conductivity. They also offer excellent corrosion resistance and unique handling strength for easy die-cutting, wrapping and forming. ZRCI’s line of refractory paper include a binderless product for applications where outgassing cannot be tolerated, non-respirable grades where fiber content is of concern, and high purity compositions where the reducing of silica cannot be permitted. An additional type of refractory papers consists of soluble, Non RCF fibers formed into highly insulating sheets. The fibers are soluble in body fluids and offer an alternative to refractory ceramic fiber blankets. These grades of materials meet European regulatory requirements, (Directive 97/69/EC). Please refer to Refractory Sheet Type RSPA-SOL. ZIRCAR Alumina-Silica Fiber Paper Type ASPA-1 and ASPA-2 are premium grade, lightweight refractory material made from high purity alumina-silica fibers formed into a highly flexible sheets. These alumina-silica fiber papers exhibit very low thermal conductivity and are designed for use in applications where purity, cracking resistance, high strength and resistance to heat are paramount. Due to their exceptional resistance to heat flow for their thickness, they provide maximum thermal resistance where space is at a premium. These materials are virtually shot free and are the cleanest refractory papers available. They are ideal for applications up to 1260°C (2300°F). Type ASPA-1 contains an organic binder to provide increased handling strength at room temperature. It possesses excellent chemical stability and resists attack from most corrosive agents. Because of its high purity chemistry, it resists oxidation and reduction. If it becomes wet due to water, steam or oil, its physical and thermal properties will return upon drying. Type ASPA-2 is produced with no organic volatiles and will not produce smoke or odor when heated. ZIRCAR Alumina-Silica Fiber Paper Type ASPA-970 is an industrial grade, lightweight refractory material made from alumina-silica fibers formed into highly flexible sheets. This alumina-silica fiber paper exhibits very low thermal conductivity and is designed for use in applications where flexibility, high strength and resistance to heat are of paramount. Type ASPA-970 is ideal for applications up to 1260°C (2300°F). Type ASPA-970 is available in a variety of thickness. ZIRCAR Alumina-Silica Fiber Paper Type ASPA-880 is a high temperature, lightweight refractory material made from alumina-silica fibers formed into highly flexible sheets. It is made from shorter and smaller diameter fibers with a higher alumina content and are laid up at significantly higher density. These factors lead to high temperature, slow shrinkage, higher strength, and better chemical resistivity. This alumina-silica fiber paper exhibit very low thermal conductivity and is designed for use in applications where flexibility, high strength and resistance to heat are paramount. Type ASPA-880 exhibits low thermal conductivity and is ideal for applications up to 1450°C (2642°F). It is used in environments where standard ceramic fiber papers will not survive. 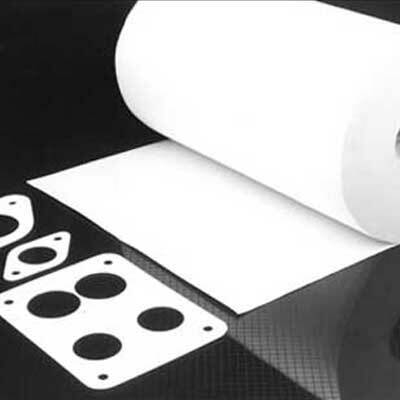 Alumina-Silica Paper Type ASPA-1 & ASPA-2 are lightweight refractory materials formed into a highly flexible sheet. These papers offer very low thermal conductivity and are designed for applications where purity, crack resistance, high strength and resistance to heat flow are of importance. Type ASPA-1 & ASPA-2 are ideal for high temperature gasketing up to 1260°C (2300°F). Type ASPA-1 contains an organic binder for superior strength and Type ASPA-2 is treated to remove all organics. Alumina-Silica Fiber Paper Type ASPA-880 is a high temperature, lightweight refractory material made from alumina-silica fibers formed into highly flexible sheets. It is made from shorter and smaller diameter fibers with a higher alumina content and are laid up at significantly higher density. These factors lead to high temperature, slow shrinkage, higher strength, and better chemical resistivity. This alumina-silica fiber paper exhibit very low thermal conductivity and is designed for use in applications where flexibility, high strength and resistance to heat are paramount. Type ASPA-880 exhibits low thermal conductivity and is ideal for applications up to 1450°C (2642°F). It is used in environments where standard ceramic fiber papers will not survive. Alumina-Silica Fiber Paper Type ASPA-970 is an industrial grade, lightweight refractory material made from alumina-silica fibers formed into highly flexible sheets. This alumina-silica fiber paper exhibits very low thermal conductivity and is designed for use in applications where flexibility, high strength and resistance to heat are of paramount. Type ASPA-970 is ideal for applications up to 1260°C (2300°F). Note: These products can be further processed to provide finished sizes. Processes such as slitting, cutting, die punching and CNC machining are available upon request.